The Stockton Inn is experiencing a rebirth. The iconic 300-year-old jewel nestled along the Delaware River in the bucolic borough of Stockton, New Jersey, is in the midst of a transformation that pays homage to its storied past while advancing it into the 21st century. After enduring extensive renovations, the property is celebrating the addition of a new chef, a cutting-edge wine and spirits program, and a dedication to superior service standards. The Stockton Inn is back, and quite possibly better than ever! The driving force behind this transformation is owner Mitch Millett, a former aviation entrepreneur turned restoration buff. Millett bought the struggling Inn in June 2012. His passion is in restoring historic buildings. The 64-year-old has refurbished more than half a dozen properties including restaurants around the country. His initial goal was to bring the Inn, built in 1710, back to its former days of glory. In the process he discovered that returning the property to its prime means as much to many of the Inn’s guests as it does to him. Over the past two and a half years, the Inn has undergone a complete physical overhaul. 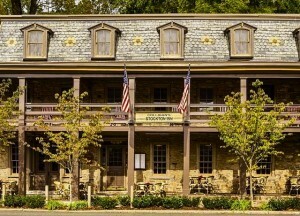 Millett has managed an exhaustive makeover of the buildings and grounds, including: new roofs; a new electric service; new kitchen equipment; extensive restorations to the historic murals (which are on-going); new furniture; and upgrades to the dining rooms and The Dog & Deer Tavern — one of the first taverns in New Jersey, which secured its operating license in 1796! He had a big decision to make: orchestrate banquets or operate a serious restaurant? Millett decided to focus on improving the culinary quality and to refocus the property as a serious dining destination. He shut down the banquet and lodging operations in December, 2013 and began the process of building a noteworthy restaurant. However, he quickly realized he needed to take additional measures to make the dining experience extraordinary. In late July 2014, Millett closed the restaurant in order to do a reset and to “re-imagine what the inn should be going forward.” During that hiatus, Millett continued with the renovations which included extensive work on its entrances, hired an entirely new full-time-only staff of restaurant professionals, and handpicked a new Executive Chef, Alan Heckman, recruited from the Washington Crossing Inn. The “new” only 20 table restaurant is now open for dinner five nights a week (Wednesday-Sunday) serving “colonial inspired cuisine” which, according to Millett, means using only the freshest and highest quality ingredients, including plenty of seafood and one pot dishes — the types of proteins and produce which the colonists may have enjoyed. During the warmer months, there will be seating on the property’s expansive outdoor garden patio. For most of the 20th Century, the property was operated by the Colligan family as Colligan’s Stockton Inn — a restaurant and hotel. During Prohibition, the Inn operated as a speakeasy. It was immortalized when its wishing well by the main entrance became the centerpiece of the song, “There’s a Small Hotel,” written by Richard Rodgers and Lorenz Hart and later featured on Broadway in 1936. According to local legend, Margaret Mitchell wrote sections of “Gone with the Wind” at a table in one of the restaurant’s dining rooms over the course of several days during the early 1930s. The Inn became a mecca for writers, artists, and thespians during the Golden Age of America and many other luminaries, including the summer home to New York’s Algonquin Round Table. Today, Millett has a new vision for the legendary property, and in August, 2014 he tapped Chef Alan Heckman to execute an imaginative menu that is delicious, progressive and remains true to the inn’s colonial inspirations. Heckman was a Navy brat who grew up all over the U.S. He found his love for the kitchen at an early age while cooking alongside his mom as a kid. Upon graduation from CIA, he was hired by James Beard nominee, Executive Chef Aaron Wright at Canlis, the 65-year-old family-owned Seattle institution, rated the 19th-best restaurant in the U.S. by Gourmet magazine in 2006. It was there, he says, that he fell in love with the restaurant industry. “They showed me the true meaning of what it’s like when your co-workers become your second family.” Next, he went on to Connecticut to work under Chef Tom Colicchio at Craftsteak. Then, in 2008 at 24 years of age, he left the U.S. and spent a year traveling the world and enjoyed a half dozen stagiaires throughout Italy, Germany, Holland and Tunisia. After his international culinary journey, Heckman returned home and he accepted the position of sous chef at Aspen Restaurant in Old Saybrook, CT between 2009 and 2010. After two years at Aspen, Alan relocated to Pennsylvania to join the Washington Crossing Inn as their Sous Chef, and after six months was promoted to Executive Chef. As part of the transformation, Millett has enlisted wine and spirits expert Brian Freedman to revamp the restaurant’s beverage program. Freedman has reworked the wine list to include what he calls “approachable vintages that pair beautifully with the Inn’s seasonally changing menu”. In addition to the wine list renovation, Freedman has conceived a selection of revamped classic cocktails which pay homage to the property’s storied past, and has forged partnerships with area craft breweries to provide freshly brewed beers which will rotate seasonally to compliment the cuisine. Learn more about the Stockton Inn by visiting http://www.stocktoninn.com. Kudos to Peter Breslow for getting his client, Stockton Inn, this story. That’s pretty much where the compliments about the Stockton Inn start and stop. The relaunch of Stockton Inn came after abruptly shutting the doors last summer, unapologetically,summarily firing the entire staff, and abandoning its longstanding wedding event program tradition. Although change was necessary the manner in which the closing and reopening were handled probably tells you more about this owner than anything. The new Stockton Inn abandoned lunch and its tavern menu. Instead, he launched a very pricey high end menu which seemed (and seems) very out of place for what’s trending today. The new Inn’s direction appears very stuffy and it’s not really clear what customer segment he’s targeting or appealing to. 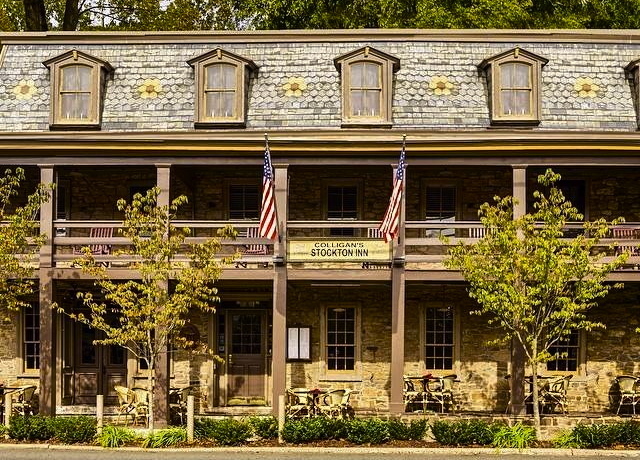 The Inn’s idyllic location in bucolic Stockton, NJ was a perfect place to stop for lunch to eat outside or sit at the tavern or the back patio. As noted, lunch is gone and so is the lunch and tavern menu. That’s a shame because some interesting gastro-pub fare would have been a nice complement to the high end dinner menu he’s trying to sell. Equally interesting is the strained relationship this owner seems to have with the loyal clients the Inn had for years. Customer acquisition and retention costs are high in every retail business. Instead of alienating the Inn’s core local customers, he should have sought ways to convert them into customer ambassadors lauding the changes he’d undertaken. This could have been achieved, more easily, by upscaling the tavern menu from tired buffalo wings and fried calamari to a new updated modern tavern fare menu for lunch & dinner in the tavern. In short, he seems to have developed a restaurant concept that no one was asking for. The menu’s a bit too foo foo (or pretentious) for seniors that might enjoy a more pedestrian menu at such a beautiful location and the new Inn’s atmosphere is a bit too stuffy to attract a younger 30-40 set. AWSOME, you go Mitch !! !